Dinitrophenyl (DNP) is a hapten that is not normally expressed in the target tissue. Therefore, anti-DNP antibody has no relevant specificity to a target antigen, and can be used as isotype control antibody to differentiate non-specific background signal from specific antibody signal in various in vitro and in vivo studies. Monoclonal Anti-DNP (Anti-Hapten) antibody, Human IgG1 (N297A) was purified from HEK293 cell culture at ACRObiosystems, and specifically reacts with DNP (Dinitrophenyl) and DNP conjugated proteins. 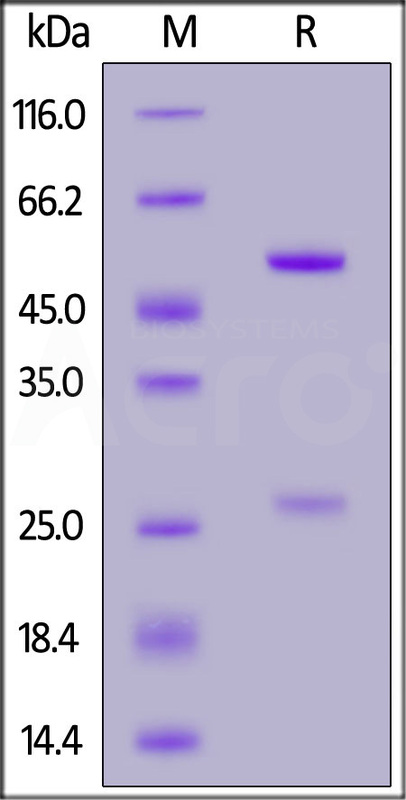 Protein A affinity chromatography from HEK293 supernatants. This antibody is suitable for use as a non-targeting isotype control in various in vitro and in vivo studies. It can also be used as a negative control in various applications such as ELISA, Western blot, immunofluorescence, immunohistochemistry, immunoprecipitation, and flow cytometry. Each laboratory should determine an optimum working titer for use in its particular application. Lyophilized from 0.22 μm filtered solution in 50 mM tris, 100 mM glycine, pH7.5. Normally mannitol or trehalose are added as protectants before lyophilization. See Certificate of Analysis for reconstitution instructions and specific concentrations. 4 ℃ for 1 year in lyophilized state. -70 ℃ for 3 months under sterile conditions after reconstitution. Binding of monoclonal Anti-DNP antibody, IgG1 (N297A) to immobilized DNP-BSA conjugate in a functional ELISA assay. A hapten is a small molecule that can elicit an immune response only when conjugated with a large carrier such as a protein. Typical haptens include drugs, urushiol, quinone, steroids, etc. Peptides and non-protein antigens usually need conjugating to a carrier protein (such as BSA (bovine serum albumin) or KLH (keyhole limpet hemocyanin) to become good immunogens). Additionally, haptens should be administered with an adjuvant to ensure a high quality immune response. It is important that the hapten design (preserving greatly the chemical structure and spatial conformation of target compound), selection of the appropriate carrier protein and the conjugation method are key conditions for the desired specificity anti-hapten antibodies. We design anti-hapten antibodies based on the HaptenDB information.